The HUAWEI DSLAM MA5616 (the MA5616 for short) is an industry-leading remote multi dwelling unit (MDU) launched by Huawei, which supports flexible configurations and provides broadband services on Fiber To The Building (FTTB) and Fiber To The Curb (FTTC) networks. The MA5616 is a box-type device measuring 2-U high and 19-inch wide and providing two GPON or GE uplink ports and ADSL2+,VDSL2, SHDSL, POTS, ISDN, FE and GE ports. The MA5616 features a high access density, high processing capability, high reliability, easy maintenance, environment-friendlily and energy conservation, and future-oriented architecture design and can be used in corridors, cabinets, indoor, and outdoor usage scenarios. When the control board is CUUB, the MA5616 supports xDSL, ISDN, and POTS, and ADSL2+ and POTS COMBO service boards. Providing the POTS service boards that can be configured in all the four slots. Providing the ISDN service boards that can be configured in all the four slots. Providing the ADSL2+ service boards that can be configured in all the four slots. Providing the ADSL2+ and POTS COMBO service boards that can be configured in all the four slots. Providing the VDSL2 service boards that can be configured in all the four slots. Providing the SHDSL service boards that can be configured in all the four slots. Tje MA5616 provides multiple specifications. Carriers can choose the ideal one according to the user density, thus best balancing the input and output. The MA5616 supports dual GE, and single GE+ single GPON upstream transmission flexibly according to application scenarios and network construction modes. 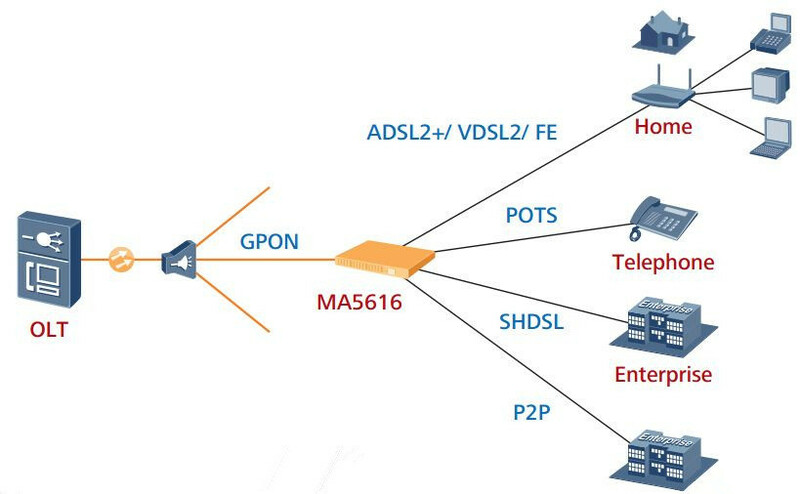 Port 1 on the MA5616 can be a GPON or GE optical port, and port 0 can only be a GE optical port. Users can configure upstream data on port 0 or a GE electrical port on the panel.